You may remember the report we covered a few days back of the “N94” prototypes doing the rounds across the internet. The codenamed device, which sounds more like something from the Nokia lineup than Apple, is suspected to become the iPhone 4S if and when it reaches fruition. Up until now, it has been mere speculation based on leaked parts, however, as MacRumors reports, Apple’s seventh beta release of iOS 5 indicates that the rumors indeed carry some weight, and the “N94” device in fact looks set to released as the understudy to the iPhone 5, enticing customers unwilling to part with top dollar for a smartphone. Looking under the bonnet of iOS 5 beta 7, which was jailbroken almost as quickly as Apple seeded it to developers, reveals a file entitled “RegulatoryInfo-N94AP@2x~iphone.png“, displaying the regulatory data for the N94 iPhone which you would find under Settings > General > About > Regulatory on any device. 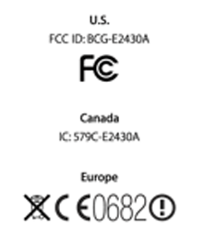 The file reveals that the as-yet unreleased N94 iPhone has been assigned a Federal Communications Commission (FCC) ID of BCG-E2430A, similar to the BCG-E2380A identifier on the GSM iPhone 4 and the BCG-E2422A identifier on the CDMA iPhone 4, which Apple released in March of this year for Verizon users. This is more than a massive hint that Apple is ready to bring the N94 device to market. A quick check of the FCC’s equipment authorization database does not yet list the device, but this is the norm – such entries do not tend to be listed until the actual announcement of the product, which we expect to be sometime this month, with a view to an early October release. With Apple being Apple, though, most of the sensitive documents and images are kept from the prying eye of the public at the company’s discretion for a period of time even after the announcement.